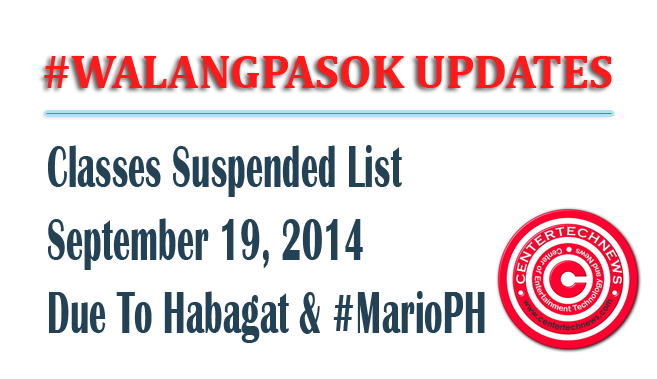 #WalangPasok ADVISORY for September 19, 2014: All Classes at all levels in several cities in Metro Manila and nearby areas suspended classes Friday, September 19, because of floods and heavy rains caused by the habagat and Tropical Storm Mario. According to PAGASA, a Heavy Rainfall Warning No.4 #NCR_PRSD Weather System: Tropical Storm MARIO Issued at 5:30 AM September 19,2014 (Friday) Warning Level: Orange Areas: #MetroManila, #Rizal and #Laguna Impact: FLOODING is THREATENING. Warning Level: Yellow Areas: #Cavite, #Batangas and #Quezon Impact: : FLOODING in low-lying areas may still prevail over these areas. Meanwhile, light to moderate with occasional heavy rains affecting #Bulacan, #Pampanga, #NuevaEcija, #Zambales, #Bataan and #Tarlac which may persist within 3 hours. The public and the Disaster Risk Reduction and Management Council concerned are advised to MONITOR the weather condition and watch for the next advisory to be issued at 9:00 AM today. 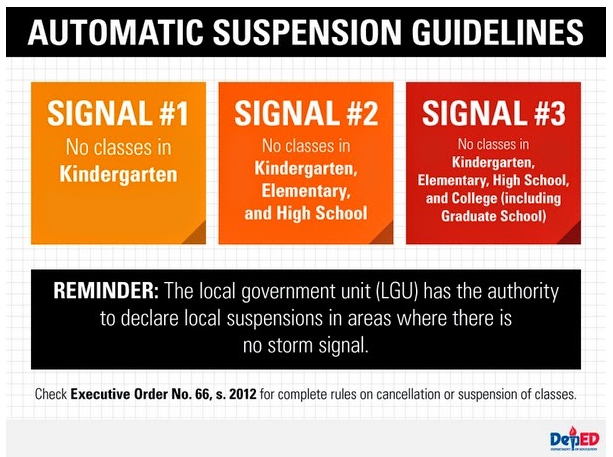 According to the DepEd and Philippine government guidelines for automatic class suspensions during typhoons are printed on the imaged shown below.